Philippe Sollers. 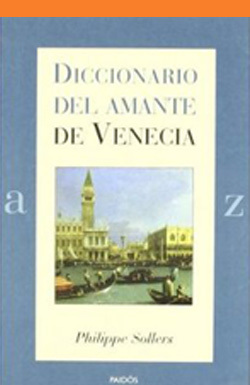 Diccionario del amante de Venecia. Barcelona: Paidós, 2005, 458 pages. Translated by Marta Pino Moreno. ISBN: 978-8449317927. Spanish translation of the original title: Philippe Sollers. Dictionnaire amoureux de Venise. Paris: Plon, 2004. Published in Spanish by Paidós.